“Being German, working for a Brazilian company and trying to convince people to change the world in London isn’t the easiest task,” says Iris Lapinski, the CEO of London’s Apps for Good program, with a laugh. But changing the world is exactly what she’s doing. The program she dreamed up teaches young people learn to create apps that transform their world, inspiring a new generation of eager tech minds. Lapinski is a German born entrepreneur who found her way to CDI Europe after working as a commercial digital media and telecoms consultant for Ovum Farncombe Technology. CDI Europe is the European Hub for CDI (Centre for Digital Inclusion), a global network of community-based centres working on entrepreneurship and community action based in Brazil. CDI’s model has been proven across Latin America, but since tech adoption is drastically different in the UK, Lapinski was required to blaze a new path. A grant from the Esmee Fairbairn Foundation in 2009 paid for a feasibility study for which Lapinski held 60 interviews across youth, digital entrepreneurship and technology over a 4-month period. When she began her research, the UK was hit with a wave of social media and new mobile technology, and the smartphone was fast becoming everyone’s most prized, must-have possession. Wanting to create something both technology focused and socially conscious, Lapinski decided that letting young people use technology, specifically mobile apps, as a tool to solve social problems would be CDI Europe’s raison d’être. She received another grant from the Esmee Fairbairn Foundation in 2011 to cover the core cost of the Apps For Good program. If you ask a student, “‘Do you want to learn how to program in HTML, PHP or Android?’ They’ll run away,” says Lapinski. “But when we say, ‘Do you want to solve a problem you’re passionate about, one that’s relevant to you?’ You reach them. Apps are the new Rock ‘n’ Roll.” It’s similar to Dean Kamen’s FIRST program, which hooks kids on engineering with robotics instead for mobile apps. The resulting 50-70 hour course includes 5 steps: Identify the problem; market research; solutions through business models, technical ability and marketing models; product design; and build and test. Satwant Singh was 25 years old when he applied for London’s Apps for Good program a year and a half ago. He was one of the first 9 students to take the course, which ran from April- June 2010 at High Trees Development Trust in South London. The program resulted in the creation of Stop & Search, an Android app that allows young people to rate their experience of being stopped and searched by the police, to obtain information about their rights and to map the search and start seeing patterns. This is particularly pertinent due to the recent London riots, and they’re currently in talks with RIM to re-launch the app on the BlackBerry platform. “It is no secret that mobile phone technology is being used by young adults, teens and children in large numbers. Apps For Good harnesses the excitement that mobile is creating amongst young people and provides young people with the tools and training to design and build meaningful products that can benefit themselves, their friends, their schools and their communities. The young girls presented their ideas for mobile apps to a panel of judges in a “Dragon’s Den” style event that included reps from companies like Magic Lantern, Mozilla (Firefox) and the Head of Open Innovation at Orange Labs UK. The 3 resulting apps are ‘Transit’, a Bengali/English translation tool for parent-teacher liaison, ‘Buzzer Buddies’ a unique buddy-based alarm clock and a third app called ‘2-the-res-Q‘, which helps students deal with bullying, and won the competition. This summer, 2-the-res-Q worked with designers and developers from Fuerte, a London based app development team to build their real-time peer-to-peer mentoring system that works via text or a phone call, like a modern day hotline. The app also includes generic tips on how to respond, a tip of the day and a section for a personal diary. 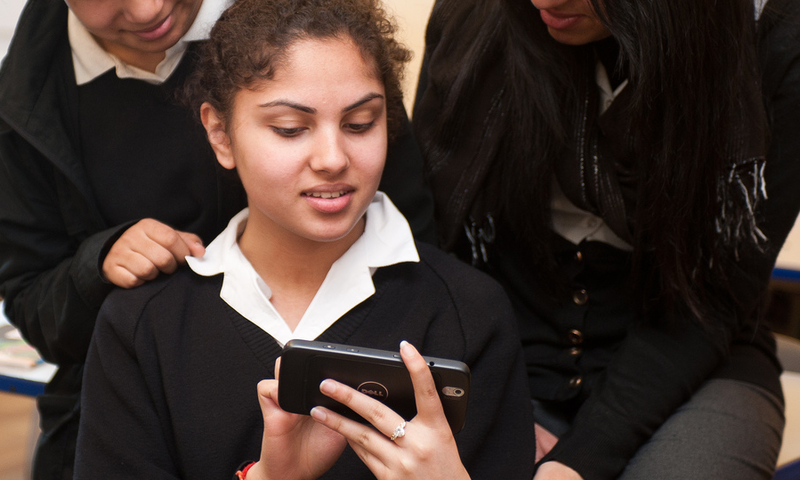 For subsidized schools in the UK, (schools that receive free meals or have special needs), Apps For Good provides free mobile devices and free contracts. All non-subsidized schools just pay for the cost of training. Later on this year, Apps for Good plans to open source its content, which is divided into two tiers: Proof learning content, which is information accrued over the past 18 months on how to go through the 5-step course, and content generated by the Expert Community, which consists of tech and dev professionals giving their time and resources to develop app ideas. Schools don’t pay for the content, it’s open sourced-based under a non-commercial creative content license. Apps For Good is now a core team of 8 people with an expert community of 150-200 designers, business people and developers from companies like Orange Labs, Fuerte, Google, (The London Android Group) Londroid and eBay. Apps for Good is supported by Dell YouthConnect and students work with people and businesses in the tech and creative world including Orange Labs, TalkTalk and Techlightenment. Nominet Trust is funding the online platform while companies like Thomson Reuters are “adopting” schools, covering the costs for the program and sending employee volunteers. There are similar programs in the States, such as Iridescent Learning a nonprofit that helps engineers and scientists connect with high school girls and underprivileged minority children in California and Oakland’s Youth Radio, which promotes young people’s intellectual, creative, and professional growth through education and access to media, albeit none with the scale or traction that Apps For Good has had. Lapinski and her team trained 50 students last year and will be training 1,500 by this fall. They plan to be in 1,000 schools next fall, reaching nearly 50,000 students by this time next year. Lapinski says about 2/3 of each of graduating classes thus far has said they want to specifically work in tech when they finish school.